Waistcoat and slipover, 1st colour: all sizes 100g. Contrast 41-56cm 100g, 61cm 200g. Cardigan, all sizes: 100g in each of 2 colours. Based on 100g balls acrylic DK. 22st/ 28 rows to 10cm, 4mm needles. Suggested yarn King Cole Comfort or any baby DK (see Snuggly DK and Peter Pan for similar colours to those shown). 3.25mm and 4mm needles. 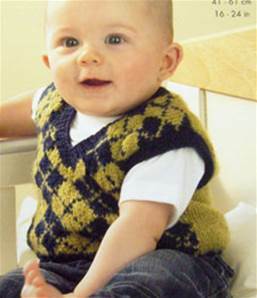 Cardigan and waistcoat 41cm 3 buttons, 46-51cm 4 buttons, 56cm 5 buttons, 61cm 6 buttons.